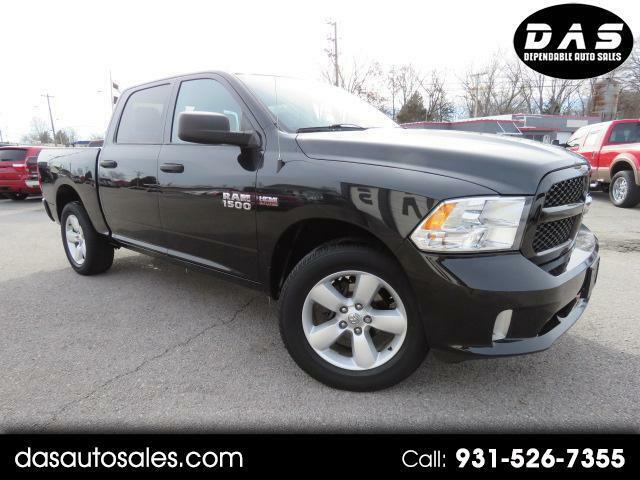 Take it to the next level with our tough 2015 RAM 1500 Express Crew Cab 4x4 shown in handsome Black Clear Coat. Powered by the legendary 5.7 Liter HEMI V8 with fuel saver technology that generates 395hp and is tethered to a 6 Speed Automatic transmission for plenty of cargo carrying capability. This Four Wheel Drive team will reward you with near 22mpg on the open road, good towing capacity, and a smooth ride with superior acceleration. You'll make a statement without saying a word when you pull up in the athletic 1500 Express that is highlighted by a redesigned black grille, chrome clad wheels, dual exhaust and distinctive inserts that enhance the aerodynamics of this strong workhorse. Designed so you can work smarter, not harder, with our 1500 Express you'll find automatic headlights, a locking tailgate, and vinyl floor covering that can take some serious punishment. Enjoy traveling in comfort and style with air-conditioning, cruise control and a great sound system with auxiliary and USB inputs. Anyone who sees it will admire the upscale interior that will make you smile every single time you slide in. As always, safety is priority number one for RAM, and with four-wheel anti-lock disc brakes, stability control, hill start assist, trailer sway control, front seat side airbags and full-length side curtain airbags you can rest easy knowing you'll be safeguarded. Now is the time to make this truck your partner for work and play. You'll be glad you did. Print this page and call us Now... We Know You Will Enjoy Your Test Drive Towards Ownership!